It is rather convenient to have Levi's birthday just six minutes after the start of the new year. (We had quite the New Year's party NINE years ago.) I keep his book lists from January - December, for instance, and it's convenient to know that he read all the books on his list at the age of eight. 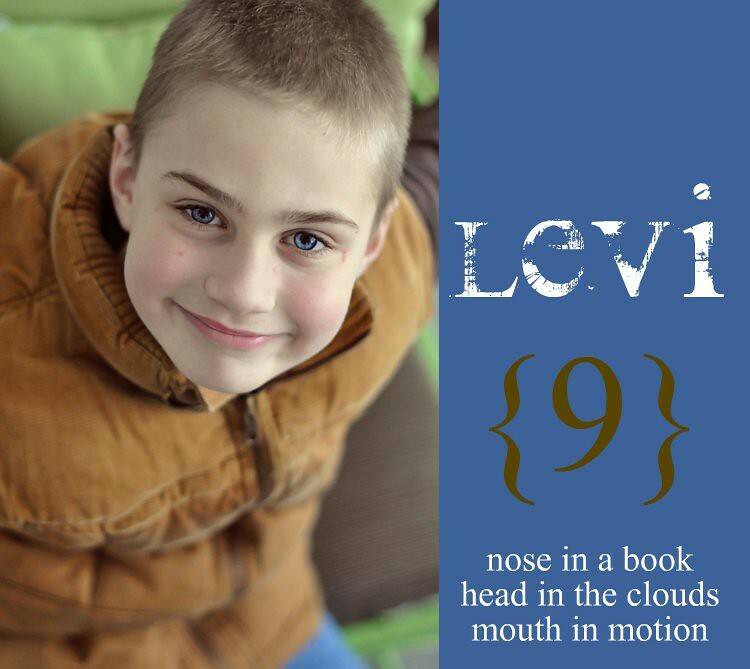 I didn't do quite as thorough a job of keeping track of Levi's reading this past year as I did the year before. I had other things on my mind, and he is such a non-sequential reader that list-making is rather difficult. He often has a whole stack of books going at once, reads a chapter here and a chapter there, and is constantly re-reading books (in parts and pieces). It drives me crazy, being the obsessive sequential person I am, but the boy loves to read a wide variety of books and does so constantly. Who am I to complain? No, I'm not endorsing all these books. Many (most) are ones I have not read. They are simply books he read this past year. Unfortunately, Levi loves fantasy (as does his dad) and it is not my favorite by any stretch of the imagination. So Dad does some of the pre-reading (or post reading) and I might feel differently (wry grin). And fantasy is one of the hardest categories to recommend without reservations, anyway. Other books are award winners, but that isn't an indication that everyone would find them acceptable. Other books are from book lists or recommendations. But, again, I haven't read most of them (or all I would do is read!) so I can't recommend them myself. Maybe I'll make up a list of books I CAN endorse (one of these days!). That's a lot of reading! Good for Levi! My older dd has just begun reading chapter books voraciously, and I'm attempting to keep a list of hers, too. Wow - that's a lot of reading! If I were still 9 I think Levi and I would get along great. Although I was never much of a talker I am definitely nose in a book, head in the clouds sort. Redwall is still one of my all-time favorite books and I also love the Wrinkle In Time series by Madeleine L'Engle. I've never kept a list of all the books Gabe has read. Each evening when I tuck him and at least 3 of his books into bed I just have to smile. Upon his waking his books often times multiply on the floor. I dont know how he can keep up with all of it. Although, I've been inspired each time you've posted Levi's list. Have you read The Sign of the Beaver yet? We just read it as a read aloud. I cried. Its a great story. Ooh, I have a non-sequential reader, too! I have discovered from this that (1) when I pick up one of her books that I think she's read and read it myself, I still have to double-check before I talk about the ending, and (2) my daughter has to be the one in charge of setting aside her finished books to return to the library, because she's the only one who knows when she's done with them! My son is a senior in high school this year, and he was just like your Levi at that age....loved to read all the time. He still loves to read and made a 36 on the ACT reading portion! I love reading about your beautiful family! My daughter is Levi's age (just 2 weeks older, technically), and she reads in the same way. I don't keep a list but I love reading Levi's list for ideas for her to read next! Our public library is newer and still has lots of empty shelf space, so I have to request books quite often. Last year I printed out Levi's list so I could use it to request books and it was 5 pages of tiny type!